On March 22nd, CSF hosted an opening event at the Gede Ball Room of the Novotel Hotel in Bogor. In spite of a citywide taxi strike and demonstration covered in the New York Times and BBC, many prominent natural resource management professionals gathered to discuss current fishery and marine conservation issues in Indonesia. Attendees from the Ministry of Marine Affairs and Fisheries (MMAF), the World Bank, WWF, CI and RARE, TNC, USAID and others also came together to celebrate the launch of Yayasan Strategi Konservasi Indonesia, as we are now officially known in Bahasa Indonesia. The event began with a welcome address by Dr. Rusdian Lubis, Chair of CSF Indonesia’s Advisory Board. CSF President John Reid and Mubariq Ahmad, CSF’s Indonesia Director, along with CSF Indonesia’s board of directors then signed the official paperwork launching CSF Indonesia. The Faculty of Fisheries and Marine Science at the Institute Pertanian Bogor (IPB) also signed a letter of agreement with CSF during the event. 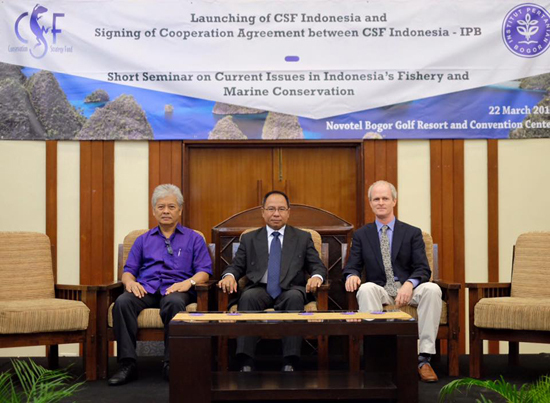 IPB and CSF Indonesia will partner closely in the coming years, working together to promote the use of economics in natural resource and fisheries management. The event closed with a seminar featuring a series of presentations on economics and policy in the marine sector, given by speakers from IPB, MMAF and CSF. CSF Indonesia exists as a result of the culmination of years of effort by CSF staff and course alumni who have worked diligently to bring CSF’s economic training and analysis to Indonesia. We would also like to acknowledge the David and Lucile Packard Foundation, the MacArthur Foundation and the Margaret A. Cargill Foundation whose support has made this work possible.